This time, they're starting in Central Florida, hanging a left through the Green Swamp and the Nature Coast along the Gulf of Mexico. They'll kayak, bike and hike through swamps with names like Tate's Hell, Bloody Bluff and Forgotten Creek. They'll hike beaches and sand dune hills in the Panhandle, ending up 70 days later at the Alabama state line. Their first steps began at the Creek Ranch in Polk County. "It's on the job training. I'm definitely not physically prepared enough," says Mallory Lykes Dimmitt. She left her job in the Colorado Rocky Mountains with the Nature Conservancy to lead this mission in her home state. "But you will start slow and build into it, so part of the first week of the trek is getting yourself in shape and just going," she says. "And you never have enough time to mentally prepare. You kind of process as you go, and so now the time is here. You try to take off and you enjoy it." It's part of a grand plan to increase the public's awareness of the need to connect the state's remaining wild areas - before they're lost forever. This trip has an added incentive because the state's voters just passed Amendment 1. That forces the state to set aside a certain amount of money for environmental protection. But just what does that mean? Already, several hands are ready to plunge into the state's pockets - even before the first new dollars are collected. Expedition member Joe Guthrie says some of that money should be used for land conservation. 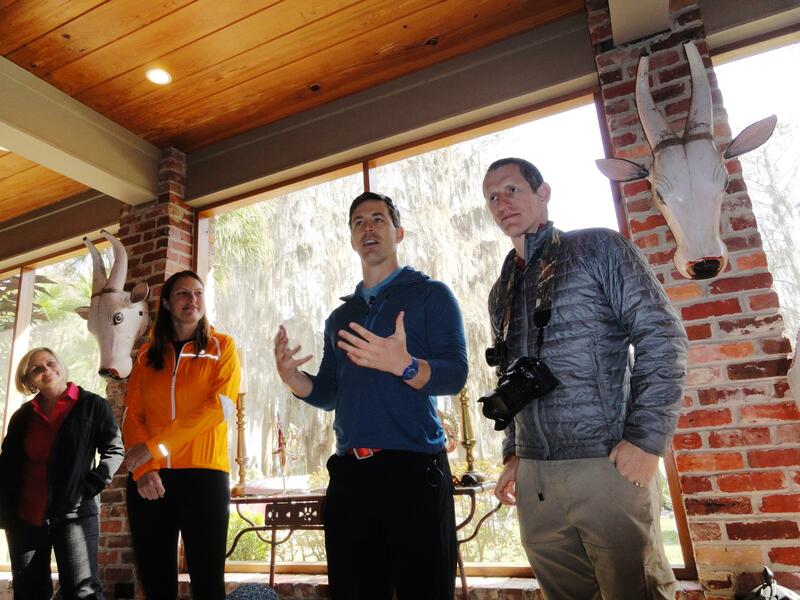 "We feel encouraged at the expedition that this is our opportunity to really put a stamp on Amendment One as coming from a vast majority of Floridians that we want to do land and water conservation," he says, "and that we have the plan - we have the "greenprint," if you will - in place and its ready to be done, and it should be done." Dimmitt says part of their trip will be to emphasize gaps in the protected corridors. 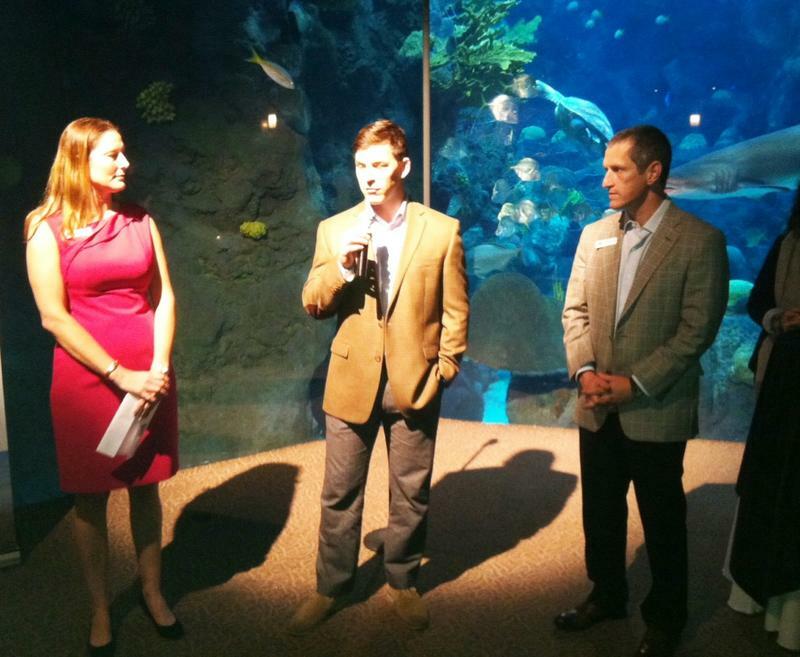 At the Creek Ranch kickoff, from left, Mallory Lykes Dimmitt, Joe Guthrie and Carlton Ward Jr.
"And I think the next steps of that are to follow on the Florida's land and water legacy and continue this voice on exactly how this 75 percent of those voters want to see it implemented," she says, "so that next step of the challenge - and this is where we still need to be involved - be diligent on how Amendment One gets implemented." In a state increasingly defined by it's development - it's strip malls, choked highways and theme parks that evoke places far away, natural Florida remains perhaps its most remarkable draw. Blackwater rivers lined with cypress trees. Swamps where early morning mists hide bobcats, black bear and of course, alligators. The blue springs that gush millions of gallons of clear water a day. But for these habitats to remain healthy, biologists say they need to be connected to each other. That, in a nutshell, is the reason for this expedition. "It's a patchwork of these public and private lands working together as a whole, and often unseen and under-appreciated by many of Florida's population and the nation's population," says expeditioner Carlton Ward Jr. He's no stranger to getting his feet dirty. The Tampa photographer has documented places as remote as Central Africa for National Geographic. But the native Floridian had a calling to do something a little closer to home. "Our aspiration is to be a window into the amazing work that so many people are doing toward this common goal," he says, "as well as shed light on the people and places who make up wild Florida." U.S. Sen. Bill Nelson was at the kickoff, saying says it's efforts like this that place a value on preserving what's left of natural Florida. "The symbolism of what is occurring today and what Carlton and this team did two years ago is so important to the future of this state, indeed to this country and indeed the planet," he says. "And so you are all starting to add to that today - added value - as you create these wildlife corridors so that future generations will be able to understand and have a glimpse of what it must have been like, back there in the beginning days." 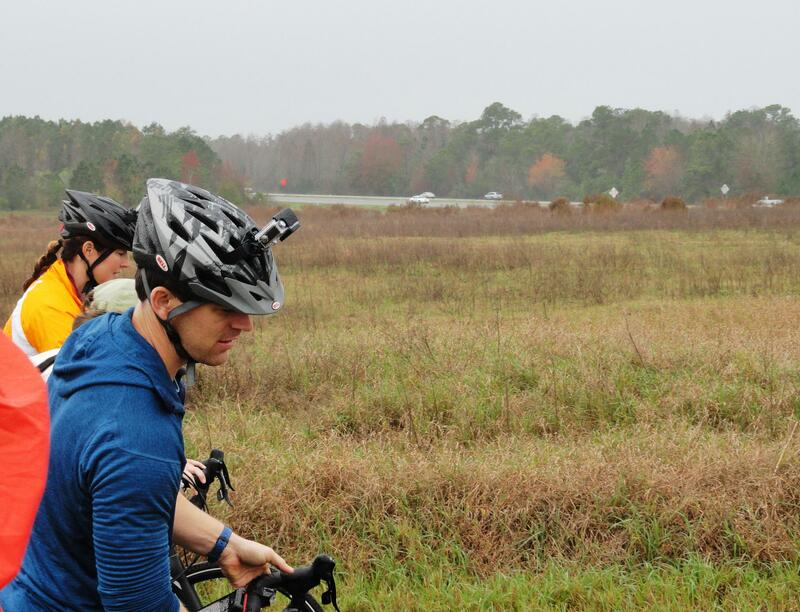 The trio then pedaled off, the first steps of another nearly 1,000-mile journey. 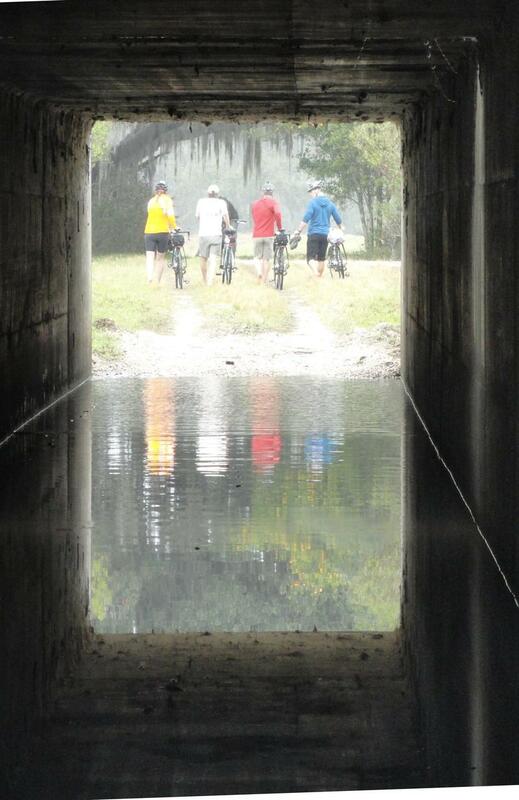 This Saturday, the expedition will host a paddle on the Withlacoochee River in Hernando County, open to the public. You can follow the expedition every week on WUSF. 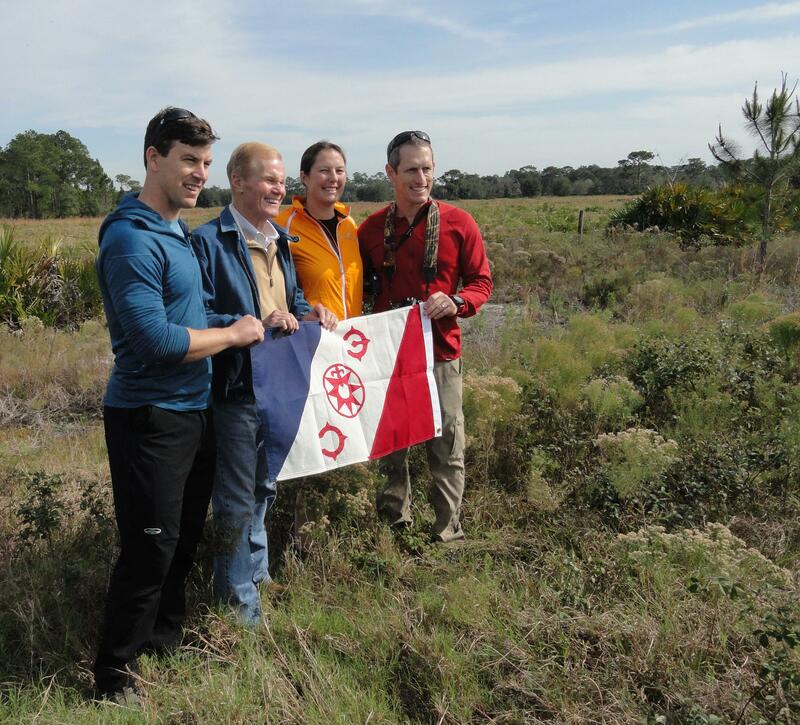 Back in 2012, four explorers spent 100 days walking and kayaking 1,000 miles up the length of Florida, from the tip of the Everglades to the Okefenokee Swamp in Georgia. The mission – to publicize the need to connect the state’s remaining wild areas. This year, the Florida Wildlife Corridor Expedition is back. 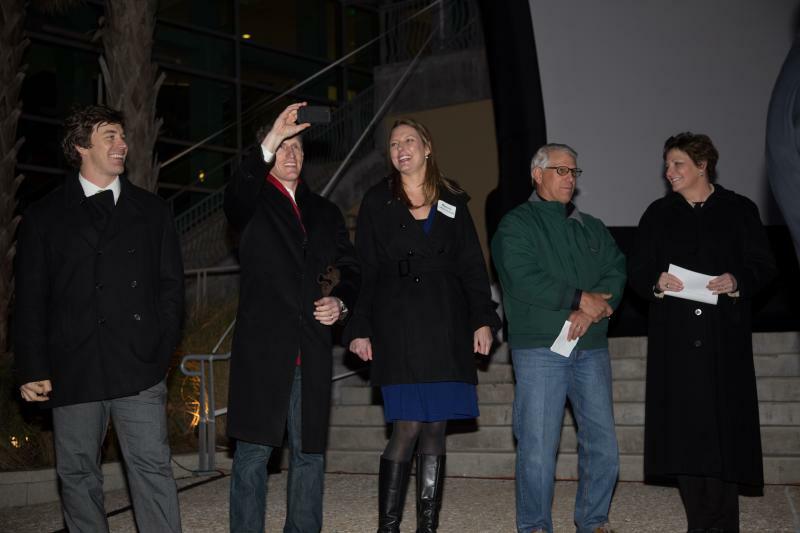 Almost 600 people braved the coldest day of the year to watch how four explorers traversed the natural heart of Florida to show a wildlife corridor could still be done in the 21st century.